Hydroxyapatite is one of the most common bio-ceramic materials which is currently used in the biomedical field. The development of hydroxyapatite is due to their crystallographic and chemical similarity to the hard tissue of human body. The present study aims to prepare hydroxyapatite from a bio-waste material (carp fish bone) as an eco-friendly and inexpensive source by calcination treatment. The calcination process was applied at various calcining temperatures; the heating rate was kept constant at 10 °C min−1. FTIR results proved the formation of hydroxyapatite at 950 °C due to the founding peaks corresponding to phosphate (632 cm−1) and hydroxyl (3572 cm−1). XRD analysis confirmed the formation of HAp at 950 °C by the presence three main peaks: (211), (112), and (300), which correspond to the characteristic peaks of hydroxyapatite. Raman analyses which displayed the calcining process remove organic components from a bones matrix. AFM showed that the size of particles is ranged between nano and microns. EDS analysis found that the Ca/P reaches 1.6589 for fish bone after calcination at 950 °C, which is close to stoichiometric HAp (1.67). Hydroxyapatite is the most common calcium phosphate family material which is currently used in the biomedical field . Due to the biocompatibility requirements, the HAp extremely utilized for bone fabrication and dental implant . There are mainly two methods to produce hydroxyapatite including chemical process  and biological source  such as sea shells, corals, pig bone as an eco-friendly and inexpensive source by calcination treatment. Calcination process is the simplest way to prepare HAp which involves heating of bones at high temperature for long times then slow cooling. In addition, there are variances when comparing synthetic (chemical process) and natural (biological source) HAp; the latest has more dynamic response and better metabolic activity to the environment . Many authors have studied the formation of hydroxyapatite, Coelho  studied the characterization of the natural nano-structured HAp produced from the Brazilian river fish bones, and the results present that structural analysis specified at the Ca/P ratio is 1.67. Venkatesan and Kim  explained the characterization of HAp obtained from tuna bones under effect the temperature. The result found that, the organic materials are extracted from the tuna bone above the 600 °C. Cristian et al. studied the influence of cooling rate on the microstructural properties of hydroxyapatite by using air (inside furnace), water, and liquid nitrogen. They reported that the lower cooling rate in air furnace resulted in formation hydroxyapatite with better crystalline quality. Rujitanapanich et al. clarified producing of HAp from oyster shell by precipitation method. The results show that, the crystallinity was improved at the pH equal to 10. Kim et al. 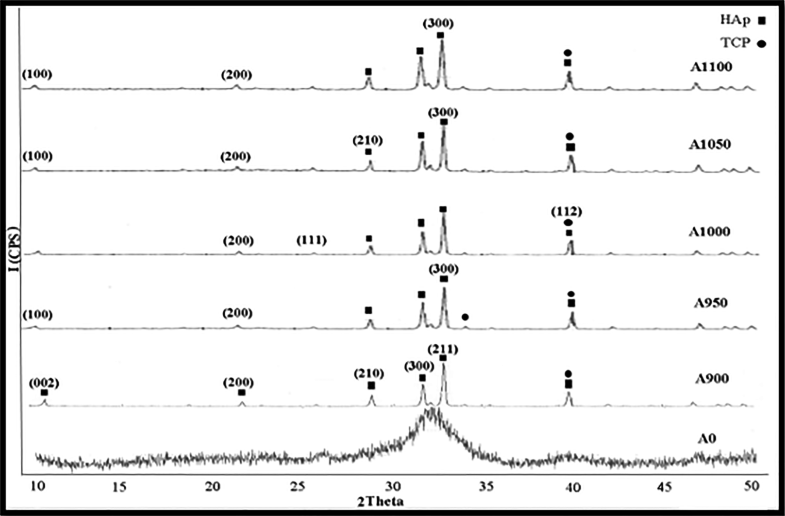 studied the short- and long-range-order structural analysis of in situ created biphasic calcium phosphates, and the results show that Ca/P molar ratio, lattice parameters, and the crystal phases of in situ formed BCP consist of β-TCP and HAp that were controlled by the degree of calcium deficiency of calcium phosphate precursors. Jaber et al. utilized the camelus bone to synthesize HAp powders, and the results present that powders obtained at calcining temperature (1000 °C) were a pure hydroxyapatite with the Ca/P ratio of 1.6557. Hammood et al. used the bovine femur bone to synthesize natural hydroxyapatite, and the results show the optimal calcination temperature to obtain near to pure hydroxyapatite at 900 °C. Hammood et al. 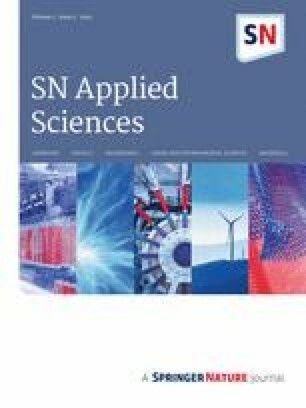 studied the comparison of nano-synthetically produced and natural HAp powder, and the results present that, the bio-waste materials which calcined at 950 °C could produce micro-hydroxyapatite that was nearly like the commercial nano-hydroxyapatite. The main objective of this study is to produce hydroxyapatite from the bio-waste Iraqi carp fish bone) Cyprinus carpio L. Fish) by easy, and economical low-cost method, as well as investigate the effects of the calcining temperature on the characterization of hydroxyapatite and determinate the optimal temperature to obtain pure HAp. Carp fish bones were used as the raw material in this study. Fish bones were boiled in the distilled water for 1 h and washed using a fast flow-water jet to eject the fish meat. The washed bones were milled by a ball milling (SFM-1(QM-3SP2)) at 4000 rpm for 4 h.
In the calcining method, 10 g of bones powder was sited in an open crucible of alumina and then put the crucible in a muffle furnace. At various temperatures, i.e., 900 °C, 950 °C, 1000 °C, 1050 °C, and 1100 °C, all the samples were heated for two hours at heating rate 10 °C/min and afterward were cooled slowly in furnace to the room temperature. Fourier Transform Infrared Spectroscopy (FTIR-SHIMADSO, Japan made) is a powerful equipment to identify the functional groups and kinds of the chemical bonds in a molecule obtained at various temperatures by producing an infrared absorption spectrum. The produced powders were mixed with the spectroscopic grate of potassium bromide. (200 mg of KBr powders was mixed with the 1–2 mg of hydroxyapatite powders samples.) 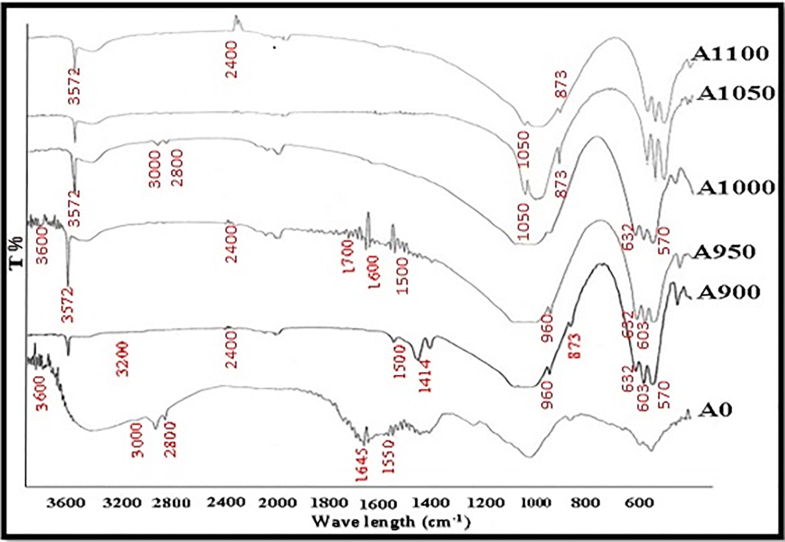 The spectra were using 20 scans with spectral resolution of 4 cm−1 and were registered in the 400–4000 cm−1 regions. The crystalline phases of the sample were determined by using XRD (XRD-6000 SHIMADZU, Japan made, using CuKα radiation voltage = 40 kV, current = 30 mA (λ = 0.154056 nm), and data were collected over the 2 theta from 10° to 50° (Bragg angle). The Raman Spectroscopy (Raman–Bruker Senterra model, Germany made) was used to explore any structural changes with substitutions in the apatite lattice. A pulsed Nd:YAG laser model (Rigaku) was used in Raman spectra using 490 mW power and 758 nm wave length with exposure time 3000 ms.
Microstructure features and the surface morphology of the fish bone before and after calcining method are detected by SEM (SEM-FEI Quanta model, Holland made at an acceleration 12.5 kV). The local chemical compositions of the raw and calcining powder are estimated by EDS (which is found as accessories with SEM). Particle size distribution and topography of the surface, 2D and 3D images of fish bone before and after calcination process, were observed under a AFM (AFM-NT-MDT NTEGRA model, Russian Federation made). Samples were exposed to ultrasonic device before exposure to AFM so that they would not be agglomerated. 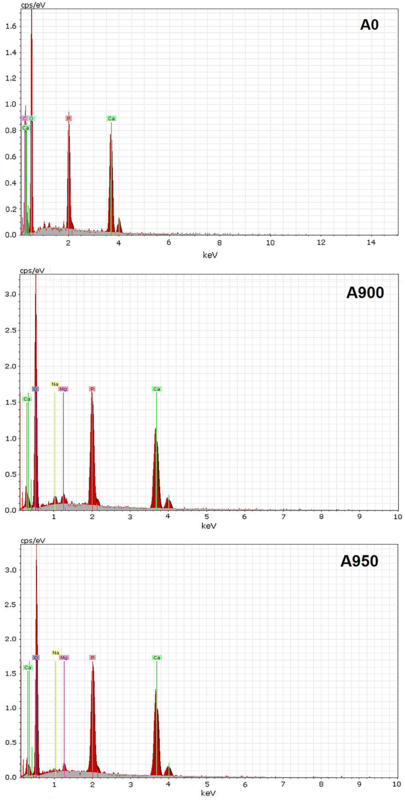 FTIR spectrum for the raw fish bone powder and calcined powders at various calcination temperatures is presented in Fig. 1. The FTIR spectra band of 1550 cm−1 and 1645 cm−1 is extant in the raw fish bone which corresponds to amides I and II of collagen  that is eliminated in calcined samples. The carbonate group exists in the peaks 873 cm−1, 871 cm−1, and 1414 cm−1–1500 cm−1, and the alkane (CH) corresponds the bands 2800–3000 cm−1 . 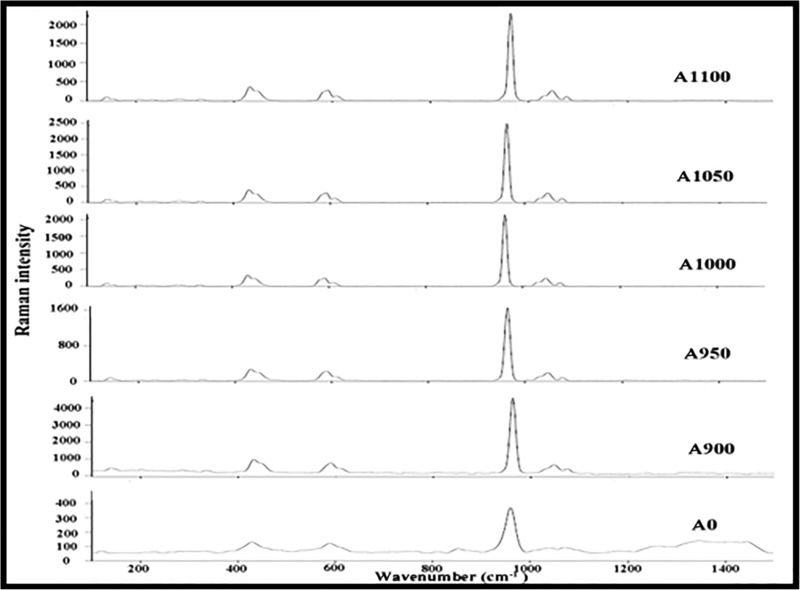 Through the FTIR spectra for calcining samples, 3572 cm−1 and 632 cm−1 bands are assigned to OH group  where these two peaks verify the existence of hydroxyapatite phase. The color of fish bones powder varied from yellow white to white color after the calcining process because the decomposition of collagen, protein, and other organic materials is present in raw fish bones; similar results were obtained by . In some samples of theses powders, a trace of water molecules implanted into the structure appears with abroad band and a different intensity between 3200–3600 cm−1 (stretching mode) and 1600–1700 cm−1 (bending mode) range . Figure 2 shows the X-ray diffraction pattern of the raw fish bone powder (A0) and calcined powders at various calcination temperatures. The XRD analysis at calcining 900 °C shows broad diffraction peaks and poor crystalline apatite. When increasing the calcination temperature from 900 °C to 1100 °C, the intensity of diffraction peaks increased. At the calcining samples, there are three major plane appeared at (300), (211), and (112) at 2 theta near 32.9°, 32.2°, and 31.8°, similar conclusions were found by . The HAp crystalline composition has chemical reaction Ca10(PO4)6(OH)2 and like HAp pattern (ICDD 00-024-0033), and the values of lattice parameter c and a can be estimated by this experience as presented in Table 1. The bands in Raman spectra for the raw fish bone powder (A0) and calcined powders at various calcination temperatures are shown in Fig. 3. A phosphate group is located at the 960 cm−1, 430 cm−1, 1030, and 1045 cm−1 , and the amide which is located at 1076 cm−1 is present at raw powder which is removed after calcination process. The spectrum of the powder before calcination illustrates that, at 1114 cm−1 a weak intensity is not observed in the spectrum of the powders, and after calcination process, this is associated to the existence the organic materials (C–H) before calcination process. 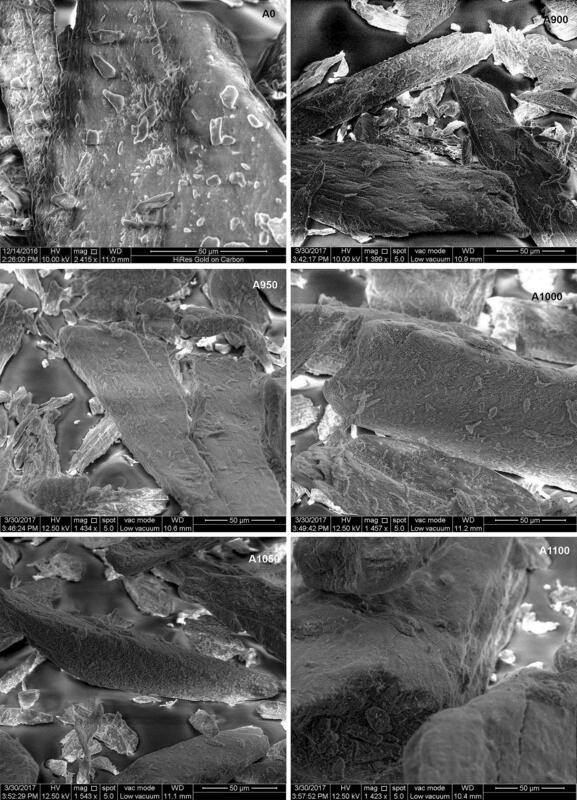 Figure 4 presents the SEM micrographs for the raw fish bone powder and calcined powders at various calcination temperatures. These micrographs illustrate the morphology of the surface which is changed when the temperature of calcining is increased and the micro-surface is unlike highly dense because it contains organic and proteins substances. The grain size is increased when the calcination temperature is increased. 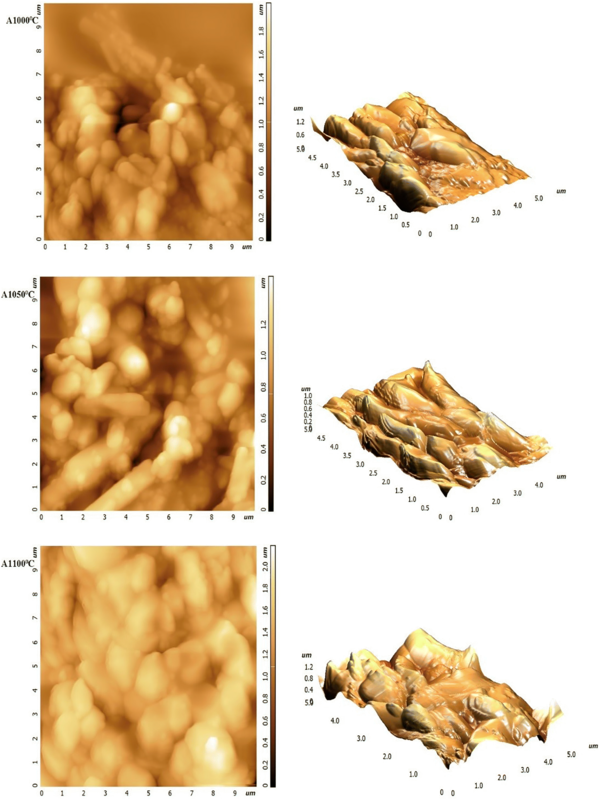 The image of SEM showed the formation of micro- and sub-micro-grains of HAp for calcined sample. Calcined bone includes multiple pores that are created by the decomposition of organic substance. The results of EDS show that, the raw fish bones powder contains the amounts of O, C, P, and Ca. Calcined bones powder contained small amounts of Na, O, Ca, C, and P. The calcined commercial nano-HAp can be seen that the amounts of P and Ca are increased when the calcining temperature increased as presented in Fig. 5, and Table 2 showed the results of calcium to phosphor ratio. 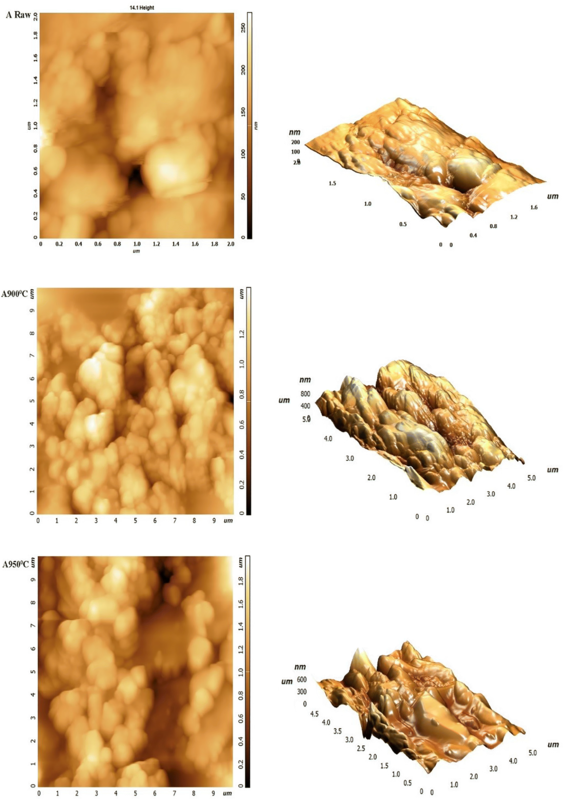 The surface topography and properties of the surface for the raw fish bone and calcined samples in 2D and 3D topographies are shown in Figs. 6 and 7. The result of these samples indicated that the size of particle changed between micro- and nanoparticles and the shape of these particles before calcination is irregular and after calcination, the shape tends to regularity and the particle size increased due to increase in temperatures from 900 to 1100 °C. From these results, it can be noticed that the very smooth surface is created after calcination treatment, in which this thermal treatment leads to alignment of grooves in the morphology of surface. This study showed that fish bone can be used as a natural material for preparing the hydroxyapatite at different calcination temperature and can be considered. The calcination process is a smart way to produce pure hydroxyapatite by ranging the temperature. FTIR, XRD, and Raman spectra results exposed that the calcination of fish bone powder at 900 °C and above could eliminate organic and proteins substances and produce the crystalline natural HAp, and by the SEM results appeared that the grains size was increased, at 950 °C obtained the best results because of the calcium to phosphor ratio was 1.6589 is approximately near to the stoichiometric-hydroxyapatite ratio Ca/P: 1.67. Values of lattice parameters are as follows: c = 0.68578 nm and a = 0.93840 nm near to the standard values of c = 0.6884 nm and a = 0.9418 nm. AFM results showed that through increasing the calcination temperature, the crystalline size would increase. The authors would like to express their gratitude to the staff of Materials Research Center/Ministry of Science and Technology, Iraq, and the authors are also thankful to Professor Nader Pravin—Amirkabir University of Technology—Iran, for amendment for this paper. Assistant Professor Dr. ASH supervised the work and provided guidance and instructions, SSH and HLJ conducted the experimental approach and prepared the manuscript, and Professor Dr. MTA helped for interpretation of characterizations. All the authors reviewed the manuscript.